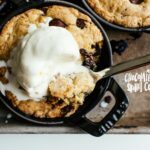 Mini skillet chocolate chip cookies, warm from the oven, which ice cream, of course! 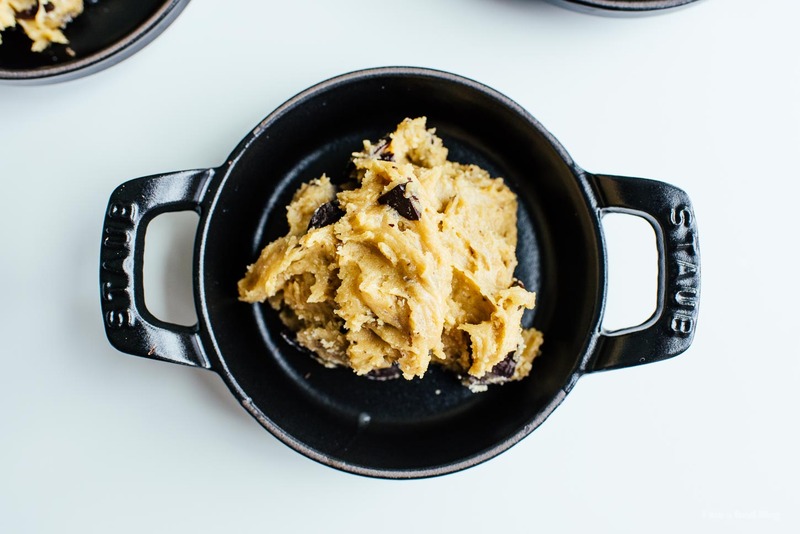 I’ve been meaning to make skillet cookies forever. I love holding on to cookies and eating them, but sometimes you just want to dig in with a spoon, to get to the gooey, melted, soft and sweet inside of a cookie. 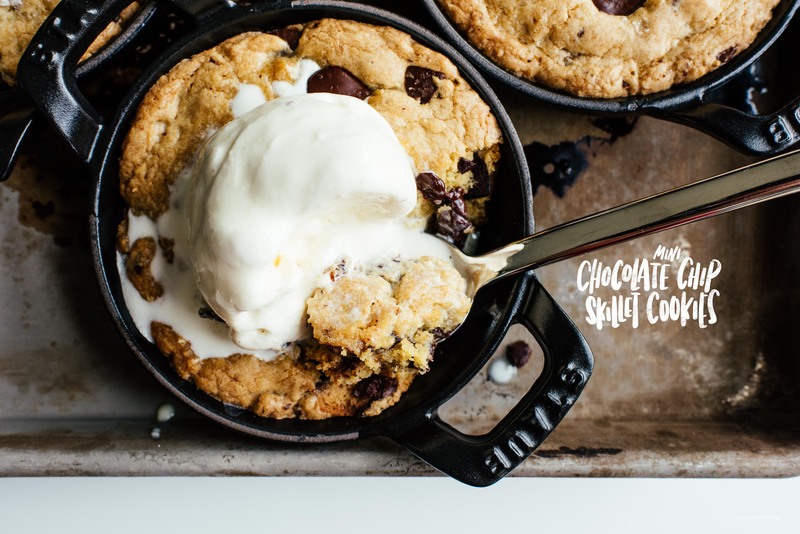 And, of course, if you’re are having a skillet cookie, you can have ice cream on top! I’m a sucker for hot and cold desserts so this is recipe is my jam. These skillet cookies come from my friend, of Will it Waffle fame, Dan. This is from his second book, Will it Skillet, which is full of skillet-able things. If you’re a cast iron skillet lover, this is the book for you. 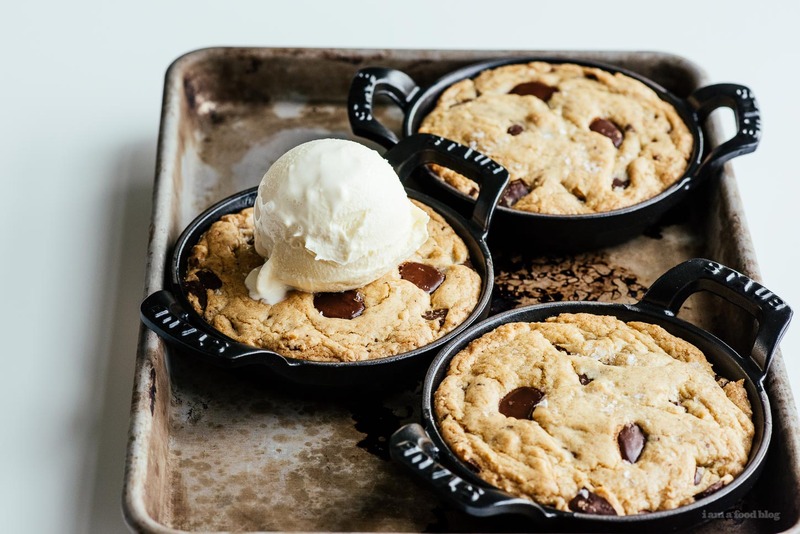 I flipped through it so many times before finally deciding on making these cookies, which, if you make in a big skillet, do not need any additional bowls – just the skillet! 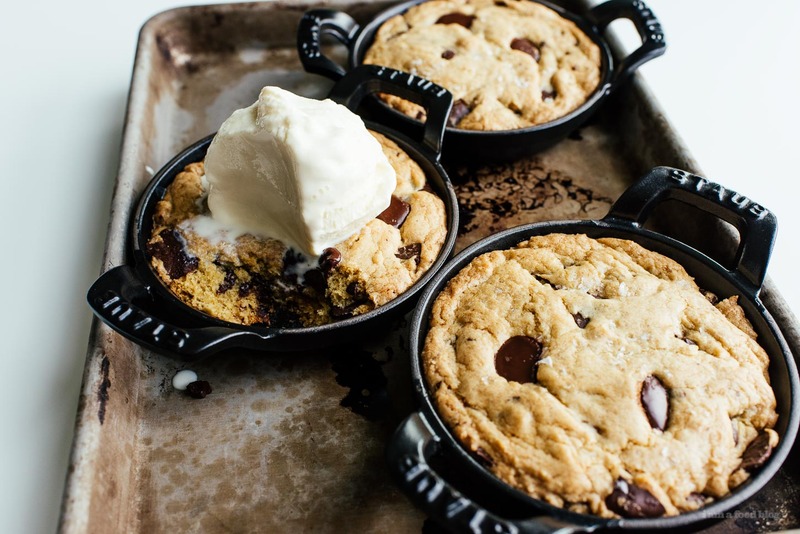 I hope you make these guys because skillet cookies are pure, chocolate chip cookie joy. Over medium low heat, melt the butter. Remove and stir in the sugars and vanilla. Allow to cool for 5 minutes. Add the egg and whisk until fully incorporated. Mix the flour, baking soda, powder, and salt in a small bowl. Add the flour mixture to the butter egg mixture in four batches, until very few streaks of flour remains. Fold in the chocolate chips with a spatula – don’t overmix! Divide into mini skillets and press the dough down into an even layer. Bake, until golden brown, but still soft in the centre, 20-25 minutes, depending on desired doneness. Remove from the oven and enjoy warm with ice cream, if desired! 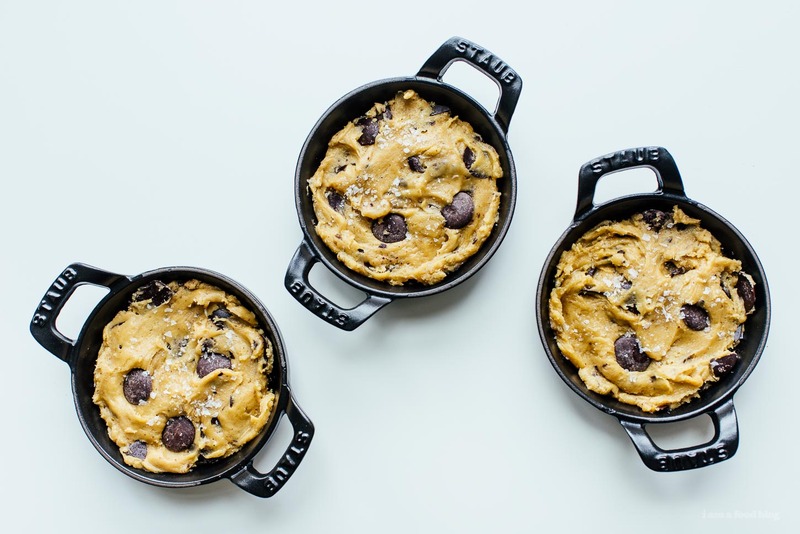 PS – If you want to make the large 10 inch skillet cookie, double all of the ingredients except for the egg – instead of using 2 eggs, use 1 egg and an extra egg yolk. Oh wow, definitely giving these a go at the weekend, they look amazing! Where can I purchase the skillets? What’s the rule on eating all three mini skillets in one sitting? Hot damn, those look freaking good! where did you get the adorable skillets? how fun! and they look DELISH!